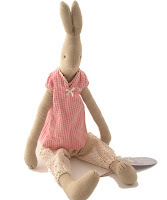 Cottontails Baby: Win a Maileg bunny! To celebrate the new website we are running a competition to win this Maileg bunny - all you have to do is visit the Maileg page on the website and suggest a name for her. We will then pick our favourite name from the suggestions and send out a bunny to the winner! Hope you and Humph are well? My too are are fine- although Millie is on medication for a tooth infection. She had her 8th birthday on Saturday so she's a very old lady indeed! The reason you can't get onto my Etsy shop is because the whole site is currently down for maintenance- I shall let you know when it's up and running again! Thank you so much for showing an interest in my work- I'm so, so glad you like my designs! I have lots more available- I just haven't had time to take photos and list them all! I am also trying to open a Folksy shop where the prices would be in British pounds! I would be absolutely chuffed to pieces if you added a link to your website! Thank you so much and if you would like it I can add your shop link to my blog also? I've added your website to a new section on my blog called Lovely Shops- you can see it on the right hand side panel under Inspired By. If you want to put it in the gallery you can.